Outs: Saints: Clark (shoulder), Hartley, North (international duty). Tom’s preview: It’s not often you have a better league record at a ground than the team who plays their home games there, but that’s what Saints have at Allianz Park. Saracens’ Barnet base has been a happy hunting ground for Jim Mallinder’s men since it opened in January, 2013. And how Saints need their good record to be enhanced on Saturday. They may have lost at the Allianz last March in the LV= Cup semi-finals, but they can still boast a 2-1 record against Sarries in the Premiership at the stadium. Saints teams have gone there and given a really good account of themselves since becoming the first side to win at the Allianz in the Premiership play-off semi-final in May, 2013. On that occasion, Jim Mallinder’s men were totally dominant during a stunning first-half display which set up a 27-13 success. They were beaten there in April the following year, but made up for that by turning the tables on Saracens in the Premiership final of the same season. And Saints then went and rubbed salt in the wounds by winning at the Allianz again in November, 2014, with the artificial surface clearly suiting their style. Saints have got their running game up and running in recent weeks and they will need all of the confidence gained from wins over Harlequins, London Irish and Worcester to win this weekend. But they should have plenty of belief, especially given their displays at the venue they are travelling to. Not only that, but Sarries have struggled slightly with key men away, suffering a stunning 64-23 home defeat at the hands of Wasps last month. Dai Young’s men are very good at the moment, but they would never normally be 41 points better than Saracens. And though Jamie George and Alex Goode will be back to boost Sarries this weekend, Saints won’t get many better chances to win at the league leaders. If they can do that, not only can they enhance their top four bid - which currently sees them sitting three points behind fourth-placed Leicester Tigers - but they can lay down a marker. Saracens host Saints in the Champions Cup quarter-final next month and though the home team will probably be much different to the one which takes the field this weekend, Mallinder’s men can still land a psychological blow. Because if they can show they mean business at Allianz Park again, old Saracens doubts about facing Saints at the stadium can resurface. Memories of that play-off semi-final humbling can return. And Northampton can again play on that underdog tag they had that day, while knowing they have the ability to win at Saracens this season. 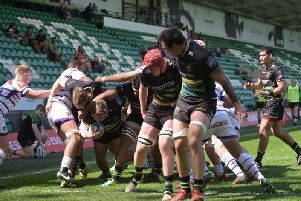 Sarries were far too streetwise for Saints in the reverse fixture earlier this season, shutting the door in the faces of the men in green, black and gold at Franklin’s Gardens. They spoiled the party in the first game held in front of the new Barwell Stand, ruining Saints’ day. Now it is time for the tables to be turned again at the start of a crucial month, which also includes clashes with Sale Sharks, Exeter Chiefs and Harlequins. Saints have eight games left to play in the Premiership and they need to start constantly adding to the wins column. They have currently won seven and lost seven in the league this season and a mixed record from now until the end of the campaign will get them nowhere. They need a run of wins. They need some self-belief on the road. And another Allianz Park success would be the perfect way to get it.